The best way to learn about All Saints is to tour our beautiful 150-acre campus! This step is encouraged, but not essential to completing the admissions process. Our Admissions Events are designed to familiarize you with the school while giving you the opportunity to experience All Saints first-hand. We hope you will join us for one of the upcoming events or schedule a personal tour. Click here to learn more and to RSVP online. 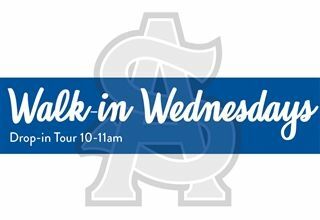 Walk-in Wednesdays - Drop in for a tour any Wednesdays from 10 - 11 a.m. No RSVP required ~ tours begin in Rogers Hall. Tours - You can schedule a tour by clicking here and indicating the best time for you. Create an online account by clicking here to apply (this includes a $50 non-refundable application fee to be paid online). Your work can be saved in progress and you will also be able to keep up with the admissions checklist online. A student's visit day is an important part of the admissions process. Prospective students will have the opportunity to "shadow" a student in their current grade level and experience first-hand the excitement and engagement of a school day at All Saints. The Office of Admissions will contact you to arrange your child’s visit. Times vary based on the age of the applicant. 3K - 4K: Testing occurs on the same day as the student's classroom visit. Kindergarten - 1st Grade: Testing occurs on the same day as the student's "shadow day." Pre-registration is required with AABL 24 hours prior to visit (we will send you an email invite). Cost is $20. 2nd - 12th Grade: Testing can be scheduled the morning of the student's "shadow day" or on a separate day in the Admissions Office. Pre-registration is required with ISEE 24 hours prior to visit (we will send you an email invite). Cost is $20. The following forms are required: Documents can be uploaded online on your myALLSAINTS account. 2. Current grades and school records required for Kindergarten - 12th Grade. Click on the link below to print the form, complete your portion, and give to the applicant’s current school. 3. A copy of the applicant's birth certificate is required for all applicants. 4. Immunization records and health forms. All students are required to submit health forms annually no later than August 1 of each school year. Once the student’s admission file is complete, we will schedule a meeting for you and your child with the appropriate division head. This is a great time to review admissions test results, go over class schedules and answer any questions you may have about student life at All Saints. The Admissions Committee reviews all applications and will contact you regarding the completed process. All offers are sent to new families in February. When a child is offered enrollment for the upcoming school year, a non-refundable enrollment fee of $250 is required along with the enrollment contract to secure the spot. There are several options for tuition payments. Click here for more information. Financial Aid is available to students in 4K - 12th grade. We encourage all families, new and current, who feel they may need tuition assistance to apply for our financial aid. Families must submit copies of their full tax return, any accompanying W2's or 1099's, and submit the Smart Aid Application: https://smartaidforparents.com/#/login. The cost is $25. This is an annual process for all families seeking financial aid for their student(s). After March 1: First come, first serve based on funds available. 10 - 11 a.m. No RSVP required ~ tour begins in Rogers Hall. Current and prospective families welcome! selecting the best time for you.